Your bones are important because they help you move, walk, stand upright, and protect your vital organs. When they are strong and healthy, they are able to withstand trauma. Genetics, gender, and age have an impact on your skeleton and there’s nothing you can do about it. For example, women generally have smaller bones than men. 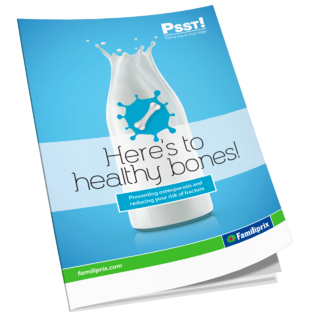 While these factors are beyond your control, your “Here’s to healthy bones!” guide will show you what an important role you can play in developing and maintaining your bone mass. You have to be active to have healthy bones!